processor, and process until smooth. Pour off the extra liquid and set aside. and cook for another minute. turmeric, and mix to blend. 5. Lower the heat to medium, add 1/2 cup of the water andthe tomatoes. Continue cooking and stirring for two minutes. 6. Add the remaining water and mix well. 7. Stir in the garbanzo beans. 8. Lower the heat to medium-low and cook for 10 minutes. for two minutes and remove from the heat. I have made the puree of tomatoes also. After frying the onions till golden brown, I added this paste little by little frying in small quantities - the trick to get the taste is to fry till the sourness of the paste. To enhance the taste, I too added the paste of cashewnuts and cus-cus (poppy seeds) to the curry. And don't forget to add fresh cream and butter just before serving! 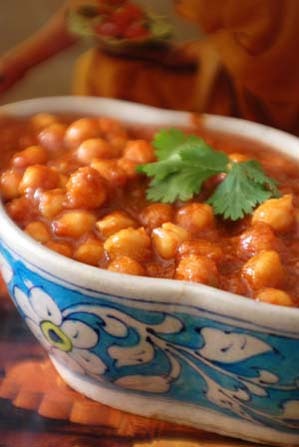 Channa Butter Masala? I think you are making up for the lost weight. i just dont know about garbanzo beans. im not that fond of them though the recipe sounds great. man you totally changed the whole site! for a minute i thought i had clicked on the wrong thing!!!! nice pic. you look like youre thinking so deeply but ill bet youre really just posing bobby!! lol. this recipe sounds good. is it really spicy? especially w/ the green chilis and red pepper. why do indian dishes usually call for so much oil? arabs cook w/ a lot of oil as well. can you cut down on the amount in this recipe? there was also another spice, 2nd to last, that i didn't know. what is that? i think i'll try this. I have make up - ppl are complaining that I have no cheeks only bones!! Oh you can use the same base for cauliflower, potato - not necessarily for the beans. It is not that spicy - in fact it has a very creamy taste. You can reduce the oil no doubt but at the expense of taste. Amchur is dry green mango powder - it is sour and I never liked it.